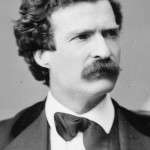 Mark Twain Speeches presented by Conor Cunneen, a Chicago based humorous, motivational speaker who has learned from, and delights in the funny, (sometimes inspirational, sometimes poignant) humorous messages from possibly the finest and most famous motivational humorist ever. 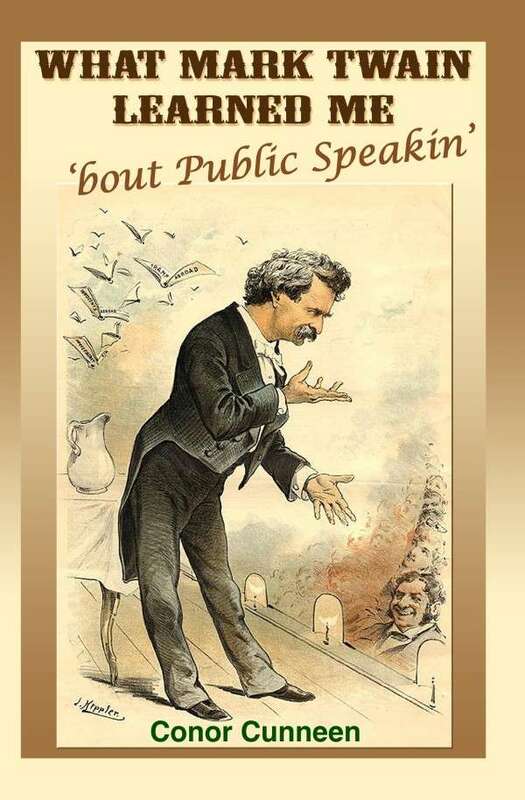 Conor’s new book – What Mark Twain Learned Me ’bout Public Speakin‘ provides wit and wisdom from the great man to help you craft better speeches and presentations. “They came here just at dark yesterday evening, and I let them in of course. Said they were going to the Yosemite. They were a rough lot, but that’s nothing; everybody looks rough that travels afoot. Mr. Emerson was a seedy little bit of a chap, red-headed. Mr. Holmes was as fat as a balloon; he weighed as much as three hundred, and had double chins all the way down to his stomach. Mr. Longfellow was built like a prizefighter. His head was cropped and bristly, like as if he had a wig made of hair-brushes. His nose lay straight down his face, like a finger with the end joint tilted up. “‘I am the doubter and the doubt—’ and ca’mly bunched the hands and went to shuffling for a new layout. —and down he fetched a right bower. —and blamed if he didn’t down with another right bower! Emerson claps his hand on his bowie, Longfellow claps his on his revolver, and I went under a bunk. There was going to be trouble; but that monstrous Holmes rose up, wobbling his double chins, and says he, ‘Order, gentlemen; the first man that draws, I’ll lay down on him and smother him!’ All quiet on the Potomac, you bet! “They were pretty how-come-you-so by now, and they begun to blow. He was a-whetting his bowie on his boot—so I let it pass. Well, sir, next they took it into their heads that they would like some music; so they made me stand up and sing “When Johnny Comes Marching Home” till I dropped-at thirteen minutes past four this morning. That’s what I’ve been through, my friend. When I woke at seven, they were leaving, thank goodness, and Mr. Longfellow had my only boots on, and his’n under his arm. The miner investigated me with a calm eye for a while; then said he, “Ah! impostors, were they? Are you?” I did not pursue the subject, and since then I have not travelled on my ‘nom de guerre’ enough to hurt. Such was the reminiscence I was moved to contribute, Mr. Chairman. In my enthusiasm I may have exaggerated the details a little, but you will easily forgive me that fault, since I believe it is the first time I have ever deflected from perpendicular fact on an occasion like this.